Two of my all time favourite brands have joined forces this year to created an amazing collaboration of fashion and accessories. As retro fashion blogger I've been wearing and reviewing Unique Vintage and Erswilder for many years and they both have a huge spot in my heart. Each label has amazing teams, creative artists and really care about both the market and the buyer themselves so when I heard that they had teamed up together to create a brooch/skirt/dress I felt instantly that they were giving the fans something we have always wanted and needed! When this collaboration was released I knew the exact outfit I had to shoot both the skirt and the brooch with and this is my little bad girl take on the sweetness that is this fabric and accessory. Having been an avid collector of Erstwilder and UV I knew that these items were going to sell like hotcakes so as soon as they were released I swooped up both the skirt and Katie the brooch so I did not miss out. This collection also features a full skirted dress but given the fit I thought it was safe to stick with the skirt as I own many more in this specific style. I wear UV skirts in a 2XL and the fit is always perfect so be sure to go by your waist measurement and consult our online size chart for the brand if you are unsure of anything. The skirt features an amazing beauty shop scene with super cute pinups under the hair dryers in their own UV dresses. Unique Vintage always blow me away with their attention to detail with prints and this style is the best of the best when paired with the matching Erswilder brooch. How adorable is Katie? Appropriately named 'Rolling with Katie' as she sports the look we all have during pinup prep and I have to say she is by far my favourite pinup brooch from Erstwilder to date. 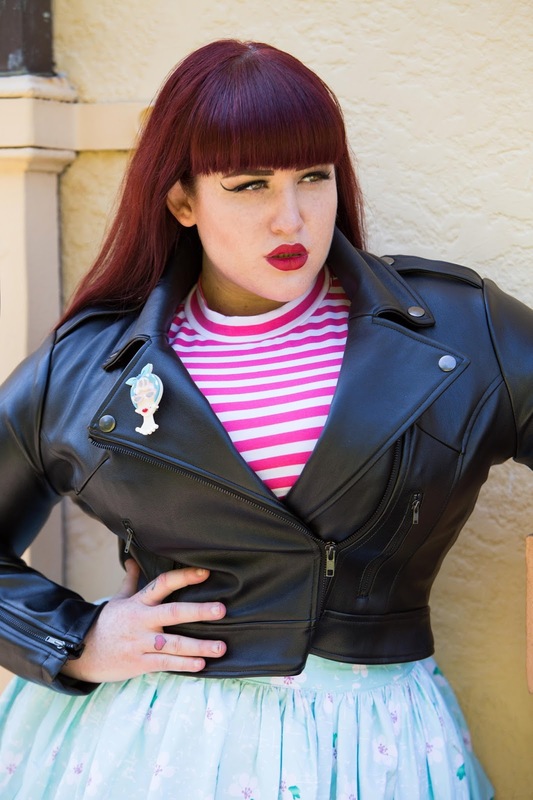 With all the pastel vibes I wanted to mix in a little leather and a bold pink so I opted for an amazing Collectif Moto and my Vixen by Micheline Pitt pink strip crop top. Yes I'm a size 2XL or XL and I'm wearing a crop top!! I'll be reviewing each and every crop from her collection very soon. 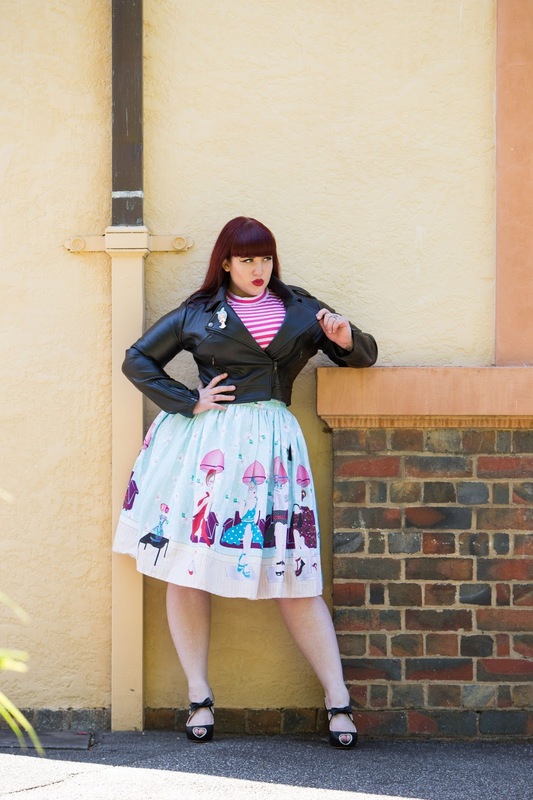 As mentioned in a very recent review I have a huge love for Collectif coats and this moto has rocked my world. Yes I might own around 10 moto jackets, yes I'm addicted and I collect them like they are rare gems but hell how can I not with a fit like this!!?? I'm wearing this style in an 18UK and it fits like a dream with room to layer both in the arms and at the waist. I can also fully zip this style which is hard for my chest these days in most motos. My stand out favourote feature of this jacket has to be the cropped at the waist fit which is super flattering. Also the fact that this has bold silver hardware and epulates makes me heart sing! I've never really paired black faux leather with such pale prints and colours but I think it's a styling must from this point onwards. 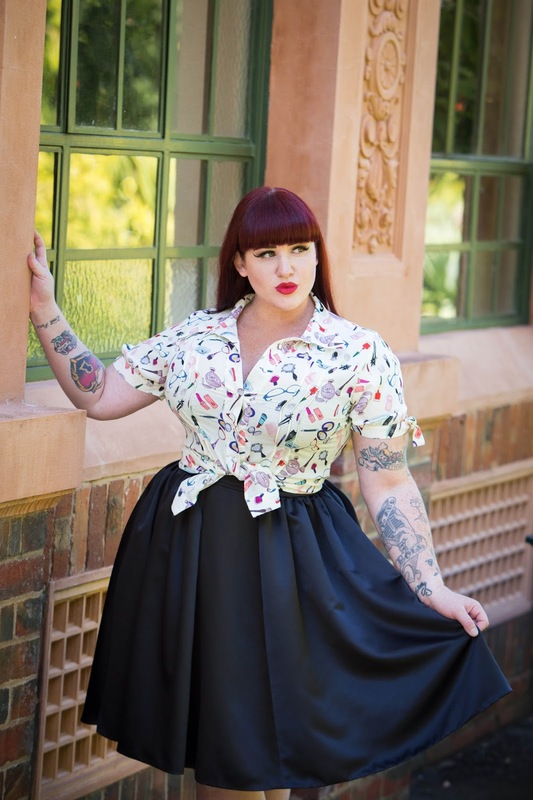 A little birdie has also shown me the next season stock to come from Collectif and I can't wait to get my paws on the new colour way of this moto! It's going to blow your minds!! But that's not all!! I've snuck another amazing UV look into this blog post! Each and every season Unique Vintage blows my mind with their new prints! With makeup, gum ball, salon, floral and plaid they have a print and style for every one moods and this week I'm absolutely smitten with their makeup prints! It's very rare to see me in a ivory coloured blouse let alone a button up but this amazing beauty/makeup print was a must have. Made from light and soft chiffon this blouse is the essential summer staple and the colour and print will blow your mind! The print features all of the essential tools to beautify yourself and some super cute cats eye specs plus an amazing fit. Now this is the first time I've worn a UV blouse and in a 2XL it actually fits! While I wear XL and 2XL at Unique Vintage I've aways had issues with button up tops and my chest but this fits over the twins and looks great with only a little minor pulling on the buttons but this is easily fixed with a no push up bra which I'm wearing in this shoot. Another amazing feature of this blouse has to be the sleeves. With larger upper arms it can be really hard to find a shirt that fits my chest and arms without being an overly shapeless blob like fit but the waist is fitted on this shirt and the sleeves are ajustible. Yes you read it you you can ajust these sleeves as they have side ties which means it can be tigher or looser - what ever you feel most comfortable with. Honestly more short sleeve blouses need this option as no two women's upper arms are alike and for the plus size ranges it would be a perfect fit choice. I've opted to tie this top at the waist with a floppy bow as that's always my preference but this also looks great fully buttoned and tucked into high waisted skirts or loose with the perfect skinny pants or jeans. Plus your accessory options are endless thanks to the them and colours used. Now UV can we please have even more prints and colour options for this top as it's a wardrobe essential for all retro/pinup clothing fans. I'd also love to see this print on a black background with bold white and pink accents and matching accessories. Many thanks to the AWESOME Damien Bowerman for shooting this bold blouse!